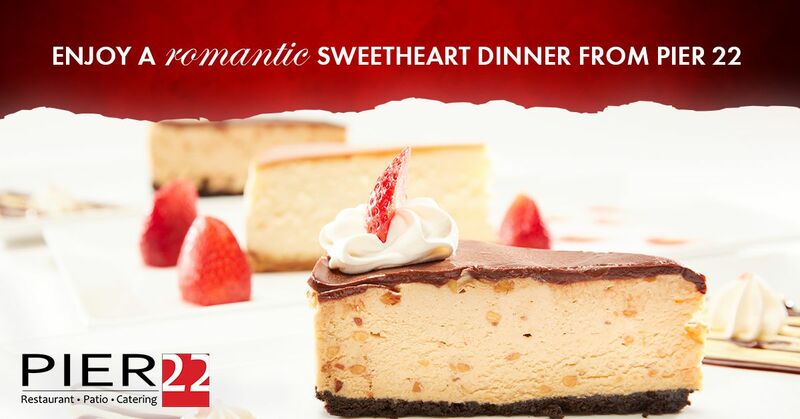 Event Details: This Valentine's day indulge your sweetheart with a delicious chef-created holiday menu while enjoying incredible waterfront vistas at PIER 22. In addition to our house-made entrees and desserts, we also offer an extensive and award-winning wine list. Your server will happily point you to the perfect pairing option. Be sure to mark the occasion with a pic on our waterside terrace. Before or after dinner you may want to take a moment to stroll down the nearby River Walk that is just footsteps away from the PIER 22 restaurant. Time: Starting at 3 p.m. Ending 10 p.m. Menu: See the full menu here!